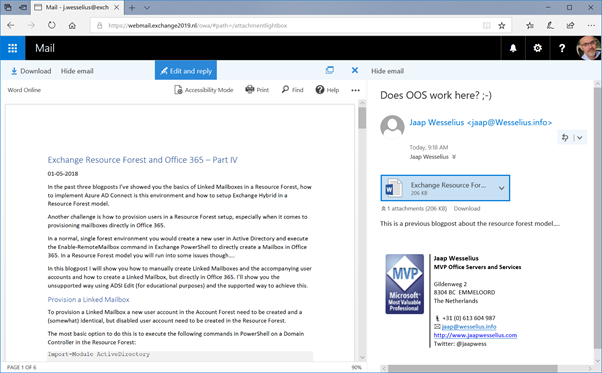 On Monday October 22, 2018 Microsoft has released Exchange 2019 publicly. Well… Publicly… Exchange 2019 is only available via Volume Licensing, so if you don’t have a VL agreement with Microsoft I’m afraid getting a legal version of Exchange 2019 can become a bit annoying. In Exchange 2016 a Cumulative Update was released every 90 days, and this Cumulative Update was directly derived from Exchange Online. Within the Exchange product team there was only one ‘branch’ and all versions were coming from this branch. In Exchange 2019 a separate branch is used, so within Microsoft there are now two branches. One for Exchange Online and one for Exchange 2019. This means that changes and improvements that are introduced in Exchange Online do not necessarily make it into Exchange 2019. At the same time, it is also possible that Microsoft introduces changes in Exchange 2019 that won’t make it into Exchange Online. Look at calendaring for example, a lot of new features are introduced recently in Exchange Online, a new look and feel etc. but these will never make it to Exchange 2019 unfortunately. 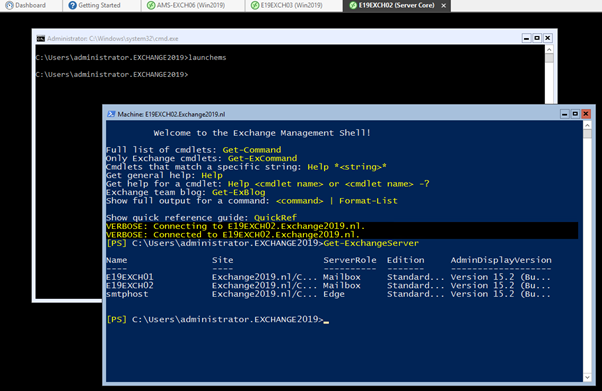 Exchange 2019 runs on Windows Server 2019, and it only runs on Windows 2019. There are a lot of security and .NET improvement in Windows Server 2019 which Exchange 2019 uses, and these are not available in Windows 2016. So, Windows 2019 is the way forward when it comes to Exchange 2019…. Also, Windows 2019 Server Core is the recommended version of Windows 2019. Because of the lower footprint of Windows, Server Core reduces the attack surface and thus improves security of the server. When it comes to Active Directory, the Domain Functional Level (DFL) and Forest Functional Level (FFL) should be at Windows 2012 R2 level. By enforcing this, Microsoft ensures customers are using a recent version of Windows for Domain Controllers, thus improving security of Active Directory. When it comes to server memory, the amount of recommended server memory is 128 GB (64 GB for Exchange 2019 Edge Transport Server). Exchange 2019 will run fine with less memory of course, but to make use of the performance improvements (in Windows 2019 and .NET Framework) 100 GB or more is needed, hence the 128 GB recommendation. The maximum amount of memory that’s supported is 256 GB. One might argue that the minimum amount of server memory in Exchange 2016 was ‘only’ 8 GB. While this is true, Exchange 2016 won’t hardly start with 8 GB of memory, and a properly sized Exchange 2016 server also has 48 GB or 64 GB or RAM, so the step to 128 GB is not that big. The maximum number of processor cores is now 48 (was 24 in Exchange 2016), and the amount of server memory is also related to the amount of processor cores, so less processor cores will certainly result in less memory. The requirements calculator will be updated soon, and once released we will have more information regarding proper sizing. If you are still interested, server virtualization is supported, but you can ask yourself if the advantages of server virtualization with these requirements outnumber the added layer of complexity (and potential hit on performance). The current hard disk technology is improving, and disk sizes continue to grow and will do the upcoming years. Disk I/O doesn’t grow, and a 16TB disk has approx. the same IOPS as a 4TB disk. The existing Exchange disk usage will suffer from performance issues with these larger disks, so in Exchange 2019 Microsoft has added ‘Metacache Database’ technology, where meta information from Mailbox databases is stored on SSD disks. So, an Exchange server will have JBOD disks where Mailbox databases are stored, but at the same time have SSD disks where this meta information is stored. The ratio SSD to spinning disk is 1:3, so for every spinning disk one SSD disk is used. This meta information can be mailbox information within a database, the folder structure within mailboxes, meta information about individual items or when items are small enough, even these individual items. For a MCDB implementation, the Exchange server needs to be configured with a reseed-enabled DAG and a symmetric SSD count and size on each server (preferred architecture! ), so all servers need to be completely identical. Meta information is automatically replicated from JBOD to SSD disks in a background task, so no need to worry about that. What happens if one SSD disk fails? It is a cached system, so all information will always be available in the Mailbox database, so when one SSD disk fails the server will automatically use the Mailbox database, but of course will be hit by a performance penalty. MCDB will result is faster logon times, faster response times and less latency, something that will be extremely useful when Outlook is running online mode (in a Citrix environment). In previous versions of Exchange, database cache was automatically and equally used by all Mailbox databases, whether they were active copies or passive copies. Exchange 2019 uses the concept of Dynamic Database Cache, where active Mailbox databases will be assigned (much) more memory than passive copies of Mailbox databases. This will result in much better performance. When a Mailbox database failover occurs, server memory is automatically re-aligned to the new situation. Compared to Exchange 2016, the dynamic database cache will result in more memory per active mailbox database, which (again) will result in better performance. Exchange 2019 introduces a new search engine called ‘Big Funnel’, based on Bing technologies. 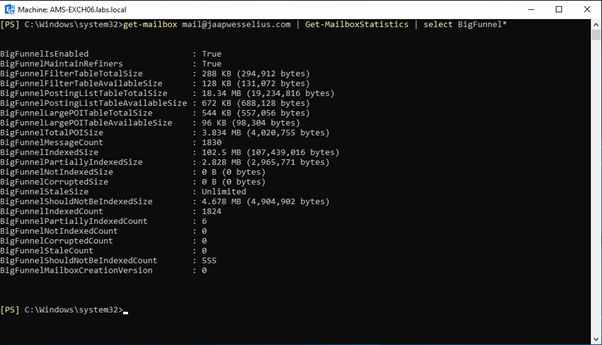 Search indexes are not longer stored on disk per Mailbox database, but search indexes are now stored inside the Mailbox database on a per Mailbox basis. As such, Search Indexes are also replicated to passive copies of the Mailbox database and these are always in sync. When a corrupt page containing search index information is found, page patching occurs to copy a healthy page from a passive copy of the Mailbox database and the active copy of a Mailbox database. Now that the content indexes are always good, issues with Mailbox database failovers no longer occur, and Mailbox database failover times should decrease dramatically. 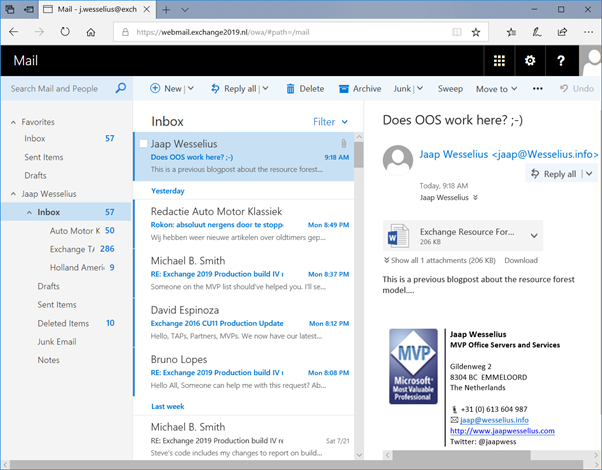 Combined with the new MCDB and dynamic database cache search results should be increase dramatically, which is again especially interesting for Outlook running in online mode. When creating a recurring appointment there’s a default end date on the appointments. This will prevent your users creating a recurring appointment without an end date, which is annoying when the user leaves the organization ending in a orphaned recurring meeting. Very nice improvement in Exchange 2019 is the possibility to block your calendar when setting your Out-of-Office during this period. Besides blocking, you can also select to automatically decline new meeting requests or decline new requests and cancel existing meetings in your OOF time. Very useful! One annoying issue with Exchange is that an Exchange admin cannot remove calendar items created by users. This is an issue when a recurring or future appointment is created by a user that has left the organization, and the meeting is an orphaned meeting. Exchange 2019 introduces the Remove-CalendarEvents cmdlet, which makes it possible to remove future calendar items created by users. 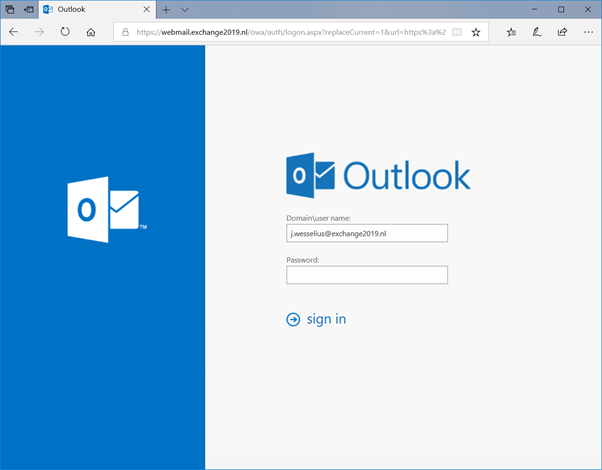 Email Address Internationalization (EAI) was already supported in Exchange Online, but now it has arrived in Exchange 2019 as well. Wat is EAI? As Microsoft announced on the Exchange Team blog “Out of 7.6 billion people in the world, only 360 million are native English speakers” so lots of people don’t even use the character set that we are using currently in Exchange. There are a lot of character sets that are not supported in Exchange. For example, I’m working with a European organization that acquired a company in Colombia. Importing these users into the existing Active Directory was quite a challenge, because they are using a Latin alphabet with diacritic. Before importing we had to convert all names and email addresses into our regular character set. Exchange 2019 now supports EAI, and you can send email to users with an EAI address. Unfortunately, you cannot add an EAI proxy or Accepted Domain yet. For more information regarding Email Address Internationalization (in Office 365) please check Jeff Guillet’s blog on http://www.expta.com/2017/12/email-address-internalization-eai.html. 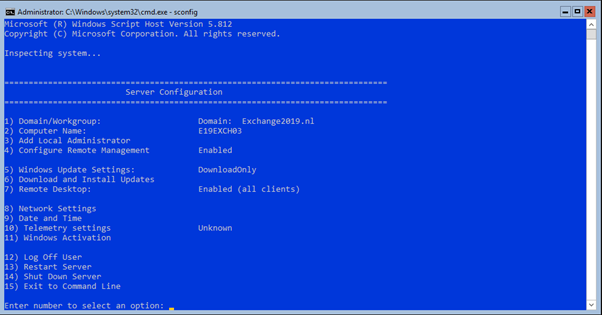 In Exchange 2019 the Unified Messaging server role is completely removed, so Exchange 2019 does not offer voice mail or auto attendant processing. You can use the Microsoft cloud voice mail option or a 3rd party PBX solution that can record voicemail messages and have these sent by SMTP to your Exchange 2019 mailbox, but that’s not really a viable replacement I would say. When moving UM enabled mailboxes from Exchange 2013 or Exchange 2016 to Exchange 2019, these mailboxes will automatically be UM disabled, but existing voicemail messages will remain in the user’s mailbox of course. Move all users and mailboxes to Office 365. Migrate to Skype for Business Server 2019. Remain on Exchange Server 2016 (supported until 2023). Exchange 2019 was released by Microsoft on October 22nd, 2018 and is the latest version of Exchange Server, targeted toward (large) enterprise customers that cannot move to the cloud (yet). As it is targeted towards enterprise customers, Exchange 2019 is only available via Volume Licensing only. This is not only true for the initial version of Exchange 2019, future CU’s will be made available via VL only as well. There are a lot of new features in Exchange 2019 like the dynamic database cache and metacache database. Combined with the new hardware requirements and SSD disk this will certainly improve performance, and Outlook clients running in Online Mode (I say Citrix) will benefit from this. Some new client features as well, like the possibility to block forwarding of meeting requests, block invites during Out-Of-Office and support for Email Address Internationalization.